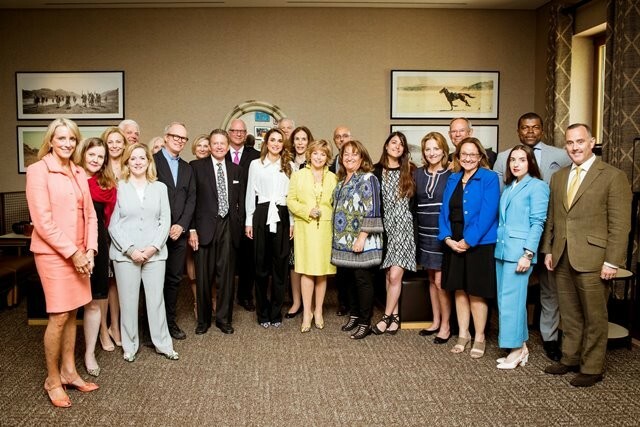 (Office of Her Majesty – Press Department – Amman) - Her Majesty Queen Rania Al Abdullah met on Thursday with visiting friends and supporters of the Jordan River Foundation (JRF) to relay Jordan’s economic and social pressures as a result of the Syrian refugee crisis. During the meeting, Queen Rania highlighted the challenges facing Jordan and thanked the group, which included leaders and experts from various sectors, for its fundraising activities. In light of the Syrian refugee crisis, the Queen reminded the delegation that over 90% of refugees reside outside of camps and highlighted the ideals Jordan has embraced while facing the influx of 1.3 million refugees. Her Majesty explained that this hasn’t been easy for Jordan and has come at a high cost, stretching the country’s capacity to its limit. The Queen also said that in the midst of these challenges and against the odds, Jordan has been committed to being an island of moderation, stability, and reliability in the region. Her Majesty thanked the 24-member delegation for its efforts, highlighting the importance of Jordan’s partners around the world, who have been supporting the country through these difficult times. The delegation included Former President of CNN Productions Pat Mitchell, Former Chairman and CEO of Boeing Phillip Condit, as well as Diane Powell, Elizabeth Duggal, Scott Seydel, the Honorable Edward Powell, Geda Condit, Alexandra Duggal, Peggy Clark, Deborah Calmeyer, Rob Breen, Jeffrey Wright, Vanessa Di Palma Wright, Ambassador Elizabeth Frawley Bagley, Kate O’Brian, Bridget O’Brian, Richard Cornelius, Lynn Brubaker, Alan Berson, Leslie Berson, John Edward Akridge III, Sarah Akridge, Dr. Paulo Da Silva, and Andrea Anson. Prior to the meeting, the group toured Jordan and visited the Queen Rania Family and Child Center, where members had the opportunity to observe the Foundation’s work with the Child Safety Program and experience the services offered by the center.